When trying to materialise something on the astral plane, our learned behaviour and knowledge from the physical life seems to work as an inhibitory factor. In order to materialise something, you have to outwit this blockage of ‘this isn’t possible’. If you leave your body, your outside area does not change continuously, but it changes step by step (this does not apply if you project or in the case of spontaneous astral travels). Everytime you pass a threshold, your surroundings change in the range of "only a bit" up to "dramatically". Let me just explain what I understand by the term "threshold". A threshold is something which prevents you from having a sight of what is coming behind, like a door, the corner of a wall or a building, a street crossing etc. This ‘changing step by step’ seems to be the result of a psychic law. Using this law, you even can realize a wish to arrive at a special place – by means of imagining this location behind the threshold in front of you. In doing this, you have a chance to approach your desired location. The rule behind these effects are subconscious mechanisms, and the threshold symbols act as a kind of facilitating factor for environmental changes – it follows our daily logic that behind a door or window there can be a totally different area. It seems that it would mostly contradict the normal logics if this happened without any threshold symbol. If you want to materialize something, you have a similar effect. Materialisations are possible on the astral plane, but if you say: "Look at my empty hand, in the next moment I will hold a bunch of flowers! ", nothing will happen. But if you hide your hands behind your back and imagine to have flowers in your hand, and then pull your hands out again – what a miracle, you’re holding a bunch of flowers! "I had went on a land route for about 50 steps when I suddendly had the urgent wish for a religious place of spiritual contemplation. Thus, I imagined that I would find a chapel not far away. With this wish inside of me, I passed a farm house and shortly after I found a chapel. Inside of the chapel, I saw several of my guides. They interestedly examined the chapel in its details (because it was a reflection of my mental and psychic state)." "I went to the altar and stood before it. 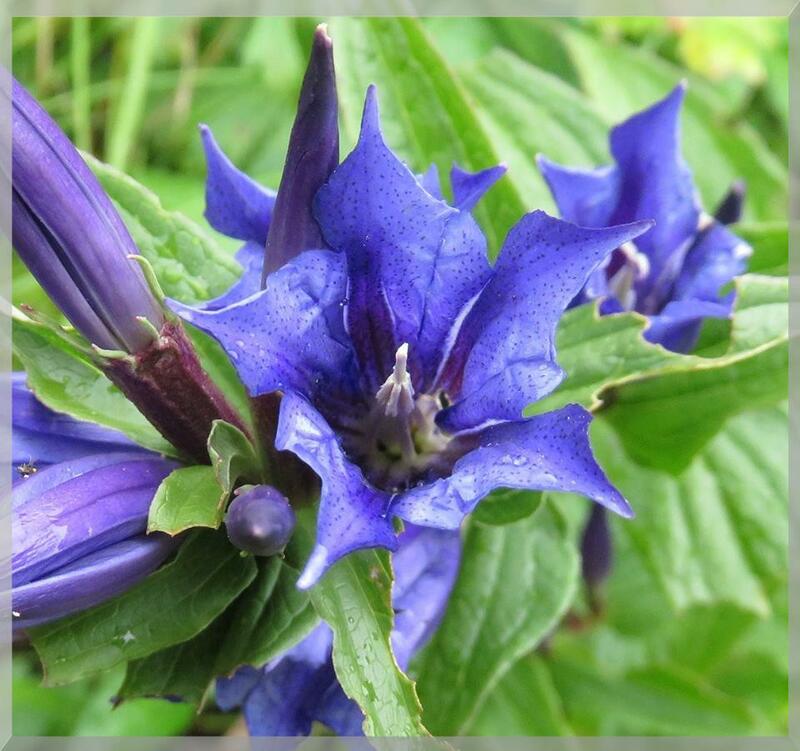 For a few moments, I held my hands behind my back and concentrated on what I wanted to create, then I pulled my hands out again and they were full of beautiful, blue flowers – actually, I had wanted to create just a single, dark-blue gentian, but the blue flowers were okay for me as well and I was amazed by the result. The flowers looked like dark-blue roses and I liked them, although they were far from perfect and I guess I still have to practise." When being with other people in the astral plane, individual imaginations can compete as well. Sometimes this will be harmless as in the following experience, but it can also lead to real fights when these different imaginations are about ‘gaining territory’ for groups with different views and opinions. "I held an empty drink packaging in my hand. To test my power of imagination, I wanted to fill it with apple juice and so I concentrated hard. But the packaging was filled only a bit. So I began to shake it, with the imagination that its contents would increase. It succeeded and gradually the packaging filled. Satisfied, I gave this drink packaging to my companion. He took it and just said: ‘It is empty’, and he threw away the packaging. From the sound of the packaging falling to the ground I could hear that it was empty indeed. Obviously, my companion had unconsciously imagined that it was empty." "Today, on All Saint’s Day, I found myself in a church in an astral dream. It was a church where black magicians held their rituals in the dim light. I was disgusted by these rituals, so I took all my strength to project golden light into the hall. This forced the worshippers of darkness to leave the hall. But they did not give up their ritual site without a fight and they succeeded in pushing back the light. In this way, victory and defeat alternated again and again. In this pointless fight, I had exhausted myself so much that I got ill on this very day. Maybe it was coincidence, I don’t know, or maybe an already beginning fever had promoted the OBE (which is possible – I once had a yoga disciple who was not able to astral travel, but when on one night she got fever and she got bored in a phase between sleep and awake during the night, she tried to induce an OBE. It succeeded, and from then on, she got the hang of OBEing)." Especially when being in an etheric OBE (close to the body), one has the impression of being in an environment which looks nearly exactly the same as the physical. But this is not the case, the objects are slightly changed. Mostly, these objects are changed through our own emotions, wishes and imaginations – to which the astral matter responds very easily and so it changes appearance. Thus, when looking at these changed objects, we often see the reflection of our own psychic and emotional state. We both often experience our altar being in an appearance that reflected our inner state. In this case, our altar is changed according to our auric vibes – darker, lighter, or with corresponding symbols or messages. A similar case would be when looking in the mirror of your room. You look into an astral counterpart of the physical mirror, and there of course you see not reflected light, but instead you see your own appearance, but often slightly changed – always according to the auric vibes (which actually reflects our psychic and emotional state – feeling joy, happiness or love causes higher auric vibes than feelings like sadness, anger or depression). On this, see also: What to expect when leaving the Body – the question about the astral mirror.